The dB-3756HE (High Efficiency) pulsed microwave power module (MPM) operates in the 9 to 10 GHz frequency range and provides 1 kW peak power at 20% maximum duty cycle. A periodic permanent magnet (PPM)-focused, conduction-cooled mini traveling wave tube (TWT) is used for power amplification, and a solid state driver amplifier provides the required RF gain. The high-voltage power supply (HVPS) section uses modular architecture and low-noise power supply topology, utilizing high-efficiency, solid state power conversion circuits. A highly stable, solid state modulator pulses the TWT grid. 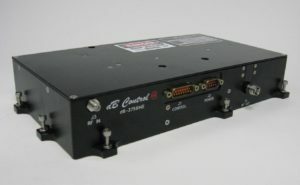 The conduction-cooled dB-3756HE MPM operates with +28 VDC prime power.